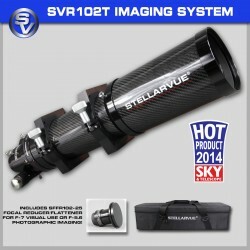 The telescope: The SVR102T is an extremely high performance, light weight 4” f-7. (714 mm focal length) air spaced apo triplet refractor. This version, with our exceptional Stellarvue focuser is our most popular telescope. Many experts have pointed out that the Stellarvue 102 has exceptional optics. Read Dennis DiCicco's review of the SVR102T as it appeared in Sky and Telescope Magazine. This package comes standard with the 2.5" Stellarvue dual speed, rack and pinion focuser with 2" and 1.25" adapters. This is our latest lens design featuring a certified, high Strehl objective. Dedicated photographic field flatteners make this not only the best 4” visual scope but an outstanding imaging platform as well. The SVR102T-25SV is the telescope in this package. The fully baffled, lightweight carbon fiber tube produces a telescope that is very light. The ota is 9 lbs and rings weigh an additional .8 pounds each. The focuser unthreads resulting in a tube assembly that is only 19.25” long, well within airline carry-on size limits. Now you can easily take a world class apo refractor on the plane with you! The certified 101.5 mm clear aperture optic is essentially perfect and comes with our interferometric test report showing it is .95 Strehl or higher. This is as good as it gets which means you will see or image everything the atmosphere will allow! Like all Stellarvue telescopes, this instrument is triple tested including a star test by Vic Maris. The Stellarvue SVR102T has been designed as our best dual purpose 4” telescope for both visual and photographic use. It delivers stunning visual performance thanks to its high Strehl, fully multi-coated objective. Photographic performance with cameras is excellent with the addition of the photographic field flattener. This is among the sharpest 4” class telescopes ever offered. See the Sky and Telescope magazine review of the SVR102T. Also, see the NEAF video that features the 102T. Fully multi-coated apochromatic triplet objective: Using a 101.5 mm f-7 apochromatic triplet objective, with an Ohara FPL-53 center element, this telescope provides extremely high contrast and reflector-like color correction. This triple tested lens is as well corrected as any a 4" apo triplet we have offered and it comes with an interferometric report to prove it. To further enhance this high level of contrast, extreme broadband multi-coatings are used on all six air-to-glass surfaces. This boosts contrast, making the stars appear vivid and the background velvet black. These coatings transmit light above and below the visual spectrum. This is important to minimize reflections seen on ccd images. Lightweight carbon fiber tube assembly: The thin wall carbon fiber tube looks sharp and matches the black anodized aluminum fittings giving this telescope a very high-end, classy look. The total weight of the ota with 3” focuser is only 9 pounds, making this the lightest 102 triplet we have ever made. The dew shield retracts reducing the length of the telescope when being stored. When the telescope is used, this dew shield may be extended to minimize dewing of the objective at night and to serve as a glare shade during the daytime. Since the focuser can be easily un-threaded, the telescope length can be reduced to airline carry on size. This means you can now carry your high end apo on the plane with you. To compare the differences between an aluminum tube and carbon fiber tube, visit our comparison page. Internal tube treatment: The main tube interior is painted ultra flat black inside and is properly baffled to eliminate any tube wall reflections. Reflections in the optical path are further reduced using edge blackened objective elements. All of these methods are used to preserve the outstanding contrast of this exceptional apochromatic lens. 2.5" Stellarvue visual/photographic focuser: This telescope comes with the standard 2.5" Stellarvue focuser. It has a higher lifting capacity than 2" Crayfords and the larger ID reduces vignetting. The ultra-smooth coarse/fine focus knobs (7:1 Ratio) and internal brake system give the user complete control when focusing and imaging. We have sold well over 1000 telescopes using this focuser. It is the best 2.5" Stellarvue focuser and it works quite well for visual use and imaging with cameras and filter wheels. Optional 3" Feather Touch focuser: For $550 additional you obtain this telescope with a Feather Touch focuser. Be aware while we have open running orders for these focusers, the makers often cannot keep up with our production. Normally, we have these focusers in stock but not always. Check with us first on availability as your order may be delayed as we await more focusers. Just email us at mail@stellarvue.com or call us at (530) 823-7796 to check availability. Aluminum hinged rings: The SVR102T comes with our American made cnc aluminum mounting rings. Each ring has five screws top and bottom. Threaded holes are 1/4-20. There is one center hole, two holes spaced 1.5" apart and two holes spaced 60 mm apart. Use the optional TP010 rail for telescope mounts using the Vixen style rail or use the optional TP6 for mounts that use the larger Losmandy style rail. C009S Heavy Duty Case: This is our heavy duty, thickly padded nylon hard case with heavy duty zippers. These cases are substantially more durable than the thin walled Chinese hard cases. SFFR102T Photographic Reducer - Field Flattener: This amazing dedicated unit will convert the visual SVR102T into an imaging system that will allow the user to take breathtaking images of deep sky objects including nebulae, star clusters and galaxies. This unit is optimized for use with either a DSLR camera (with t-ring) or the Starlight Xpress camera available above. Light gathering and magnification power: The purpose of a telescope is to gather light and magnify the apparent size of the object being viewed. A 4” refractor gathers 213 times the amount of light of the naked eye. This will reveal faint objects in space. Magnification power (the increase in relative size of the object being viewed) is dependent upon the eyepiece being used. Different eyepieces provide different magnification powers. Since this telescope uses a highly accurate, hand figured objective lens and is triple tested in the USA, these telescopes are free of coma and astigmatism seen in many import telescopes. This provides sharper details when viewing at higher powers. Dawes limit, which is the stated maximum power for telescopes under good conditions is about 250 power for a 4” telescope. But don't be surprised when you exceed this power on a steady night. This is a true apo triplet capable of very high power when conditions permit. Check the Recommended Accessories section to make the best choice for eyepieces. Two year warranty and Stellarvue Service: Stellarvue telescopes and accessories are covered by a two year warranty. But it does not stop there. Since we are a telescope maker, we can repair your telescope for a nominal fee years after it goes out of warranty should you accidentally drop it. Buy a Stellarvue with confidence. Our customer care is legendary. What else will you need to use the telescope? Star Diagonal: Our fantastic 2" Star Diagonal. Starlight Xpress SX694 Combo: Starlight Xpress SX694 ccd camera, mini filter wheel and Lodestar 2 autoguider. DSLR T-Ring: Choose the appropriate 42mm T-ring for your particular camera brand. CCD Camera: Choose from our wide variety of 42mm extensions to match the backspacing of your camera, call us if you need assistance calculating the correct distance. Filters: Astrodon filter set (LRGB and Ha made for the SX694 filter wheel). Finderscope: F50M2 Finderscope and mounting rings. Eyepieces: We recommend the complete assortment of Stellarvue Optimus Eyepieces. The 20 mm will provide you with an enormous field of view which will make it easy to locate objects you see in the sky, It will also show you extended objects like the Andromeda Galaxy. Scan the Milky Way with this eyepiece and see hundreds of stars in each field of view. The 9 mm eyepiece is ideally suited for deep sky objects including nebulae, star clusters and faint galaxies. This eyepiece reveals more structure in faint nebulosity with higher contrast. The 3.6 and 4.7 are perfect for viewing planets, double stars and smaller craters on the moon. Under average skies the 4.7 will work best but when the seeing conditions are optimal, the 3.6 mm will show you more detail and enlarge smaller objects even more. AVX Mount: The Advanced VX mount is a lightweight and portable motorized, go-to mount. It takes several minutes to set up but once you do, you can use the computer to locate objects and once they are in the eyepiece, the tracking function will keep them there. MYT Mount: The Paramount MYT is THE best mount to use for astrophotography. It is pricey but works perfectly.